Electraeon American Classic Series Derby Covers for Harley Davidson Motorcycles. 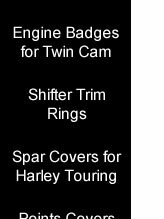 American Classic Series Derby Covers for Harley Davidson Motorcycles. American Classic Series Derby Covers feature model specific inset classic styled script that is machined into the surface and painted black. The covers are from CNC machined 6061-T6 billet aluminum and finished in fine quality triple plate show chrome. Derby Covers are available in 7 styles for: Road King, Street Glide, Electraglide, Road Glide, Ultra Classic. American Classic Road King Derby Cover. American Classic Electraglide Derby Cover. American Classic Ultra Classic Derby Cover. American Classic Street Glide Derby Cover. Forward set lettering for passanger floorboards. American Classic Street Glide Derby Cover. Center set lettering for passanger footpegs. American Classic Derby Cover Road King. American Classic Derby Cover Road Glide. American Classic Derby Cover Ultra Classic.